Tour length - Approx. 10 hours (Pick up time - 8.30am; Drop off time - 6.30pm) depending on pick up location. Departure points - various central PERTH locations including all hotels, apartments, hostels and the Wellington Street coach stand - click here for the full list. Please call 1300 135 752 or email info@exploretoursperth.com to check. JOONDALUP/WANNEROO - for this tour only we can pick up from outside Leapfrogs restaurant & Wanneroo Botanic Gardens – 25 Drovers Pl, Wanneroo WA 6065 @ 9am. The Pinnacles, two hours north of Perth, are an easily accessible natural wonder waiting to be explored. Next to the town of Cervantes and located within the desert landscape of Nambung National Park, the Pinnacles are fascinating limestone formations up to four metres high that were derived from seashells thousands of years ago. The Pinnacles themselves are a must see natural wonder on any trip to Perth, throw in a visit to a beautiful beach, Yanchep National Park to see Koalas and a factory tour and lunch at the Lobster Shack and this day trip is a great day out for all the family. The Explorer Bus returns us back to Perth at around 6.30pm having experienced some of the best activities that the region has to offer. Looking to include a visit to a Swan Valley vineyard instead of the Lobster Shack? 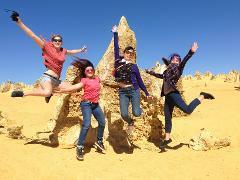 Then take a look at our 'Best of Perth' tour which includes the Pinnacles and Sand Boarding as well. Departure points - various central PERTH locations including all hotels, apartments, hostels and the Wellington Street coach stand - go to www.exploretoursperth.com.au/departure-points for the full list. Coffee - Smell and taste coffees from around the world at Yahava Koffee Works. All of the above is included in the price of the tour. The only additional expense you may incur is for any drinks that you have with your lunch (apart from the complimentary glass of wine). The Margaret River region is absolutely beautiful but it is a three hour drive from Perth and you will spend extended periods of time on our Explorer bus. Therefore this trip may not be suitable for young children. 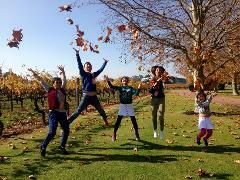 Explore the beautiful Swan Valley in half a day - Food, Wine, Coffee, Chocolate and Aboriginal Art. Both locals and visitors from all over the world, catch the ferry or take a cruise to get up close to the wildlife*, explore nature trails, swim, surf, snorkel or to enjoy a family picnic and the safe, sheltered beaches. The little penguins are very shy and can be very difficult to see in the wild but you can get up close and learn all about them with the rangers at The Discovery Centre. (During June to September the Penguin feeding takes place at Caversham Wildlife Park as the Discovery Centre is closed for the breeding season. As a result you are not likely to see Penguins on Penguin Island during June to September). *Please note: Unfortunately, due to the inherent nature of viewing wild animals and sea-life in their natural habitat, sightings of wild Penguins, Dolphins, Sea-Lions and birdlife cannot be guaranteed. We can only guarantee Penguins in the Penguin Island Discovery Centre or at Caversham Wildlife Park in the winter months. End your brilliant day with a chance to taste chocolate at a chocolatier in the Swan Valley and indulge in a wine tasting experience at a premium WA vineyard. 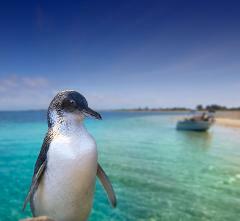 - Board the ferry from Mersey Point Jetty for the shot five-minute journey to Penguin Island. - Board a wildlife cruise for a 45-minute glass bottom boat cruise to view rare Australian Sea Lions, Pelicans and great views of the Islands. - Drift over the seagrass meadows and limestone reefs spotting fish, crabs and other marine life through the glass bottom. - Lunch is served back on the mainland at the wonderful Pengo's cafe where you have the choice of a fine selection of hot and cold food. - After lunch, you jump back in our Explorer bus and head toward the Swan Valley and Whiteman Park. Watch out for wild Kangaroos as we drive into the Conservation reserve. - In Caversham Wildlife Park you will be given a tour to see all of the amazing native Australian Wildlife. 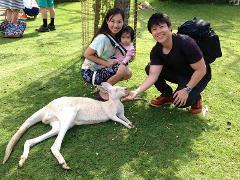 - Feed Kangaroos, have your photo taken with Koalas and meet a Wombat. - Whilst in Caversham you will also have the chance to watch a live Australian Farm Show - watch Sheep shearing, crack a stock whip, milk a cow, bottle feed a Lamb, meet a Stockman on horseback, swing a billy, watch sheepdogs mustering the sheep – all the excitement of a true blue Aussie farm! Important Note: On rare occasions, the weather or tides may stop the wildlife cruise and/or Penguin Ferry. When this happens the tour will divert to Mandurah for a scenic Dolphin cruise with lunch held at a restaurant in Mandurah instead. Sightings of Wildlife in their natural habitat, cannot be guaranteed. 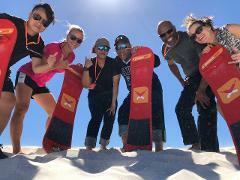 On this fun and informative walking tour you will get to explore the historic and cultural highlights of Perth City with one of our fun, bubbly and passionate Chief Explorers (Tour Guides). 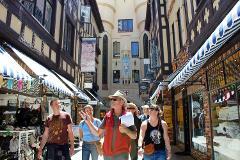 Explore hidden laneways within central Perth that house boutique cafes and shops. Discover the growing street art around Perth from local and international artists. Learn about the history of Perth and how it has changed over the past 200 years. Plan your evening entertainment in Perth as your guide points out the lively nightlife spots. Found out how to get around Perth and beyond using public transport including the free buses. The tour is approximately 90 to 100 minutes in length. With Perth being relatively flat, the tours are not too strenuous. The walking tour is wheelchair friendly as there are no steps. Wear comfortable walking shoes and a hat/sunscreen is recommended. We also suggest a bottle of water and don’t forget your camera. 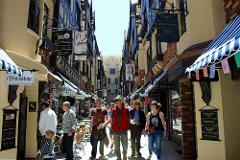 Explore Perth City with 3 fantastic local experiences in one easy sightseeing day pass. 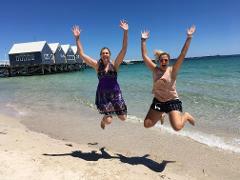 On this fun and informative walking tour, you will get to explore the historic and cultural highlights of Perth City with one of our fun, bubbly and passionate Chief Explorers. Explore hidden laneways that house boutique cafes and shops, discover the growing street art scene, learn about the history and future of Perth. There isn’t a better way to see our beautiful river and city than traveling in the exquisite comfort of a Little Ferry solar electric ferry from Elizabeth Quay. Sit back, relax and enjoy the river whilst the skipper provides informative commentary. The Bell Tower is one of the unique things to see in Perth with the famous bells from St Martins in the Fields, London. Entry ticket includes unlimited access to all five public areas of the Tower and participation in the Interactive bell chiming demonstration. Enjoy breathtaking views of the Swan River, Kings Park, Elizabeth Quay, City of Perth and the Darling Range. Ferry Ride - Approx 2 hours. Meet at the Little Ferry Boat Terminal at Elizabeth Quay at 2.50pm for a 3pm departure. Please Note: Your tour will be confirmed once we have confirmed your booking with the other experience providers. Times and dates cannot be guaranteed, however, you will be given the option of a full refund or alternative dates/times if the preferred date is not available. Service length - Approx. 5 hours (Pick up time - approx 8.30am; Drop off time - approx 1.30pm) depending on pick up location. Departure points - various central PERTH locations including all hotels, apartments, hostels and the Wellington Street coach stand - go to www.exploretoursperth.com.au/departure-points for the full list. SWAN VALLEY/GUILDFORD - for this tour we can pick up from outside Guildford Train Station and the Swan Valley Visitor Centre on the corner of Swan Street and Meadow Street. Park Arrival Time - approximate time of arrival at Caversham Wildlife Park is between 9am and 9.30am. Park Departure Time - customers are required to be waiting outside of the Wildlife Park for the return journey at 1pm. Note - exact pickup and dropoff times will vary on each day due to traffic and roadworks. We guarantee you will always get at least 3.5 hours at the park and adjust the return time to accommodate this. 3.5 hours is plenty of time to see all of the animals and attractions at the park. Access to Whiteman Park Village - explore the art gallery, print shop, handcraft centre, the village cafe and more.